Why did the Lancashire Watch Company Fail? Lancashire Watch Company, 1902. A 14 size "dummy" (with a dummy fusee in the form of a barrel to change the winding from clockwise to anti-clockwise). It has an unusual "British Watch Company" dial. The Lancashire Watch Company failed four times during its short life from 1888 to 1911. Three times it survived major financial difficulties until its unpaid debts forced the company's machinery to be sold at auction. 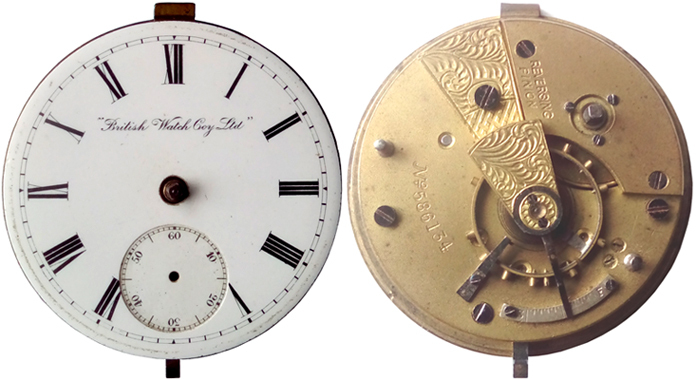 Although the sales ledgers of the company have not been analysed, it appears that the LWC was able to sell the watches it made, but there was not enough profit to service its debts. This article is based on the financial statements of the company and examines the reasons for its failures. Illustration: Lancashire Watch Company, 1902. A 14 size "dummy" (with a dummy fusee in the form of a barrel to change the winding from clockwise to anti-clockwise). It has an unusual "British Watch Company" dial.